In the ’90s there was a movement within America that equated clarity with purity. Pepsi decided to jump on this trend and create a colorless decaffeinated soda. Pepsi hoped that people would notice a colorless soda above other darker sodas and think that it’s more pure due to it’s colorless appearance and assume it would have less artificial coloring. Pepsi dubbed their new soda Crystal Pepsi and released it and a diet version to 9 test markets in early 1992. Many people don’t remember, but Crystal Pepsi did well the first year grabbing almost 1% of the soda market. It did well enough to cause Coca-Cola to develop and release Tab Clear in December 1992. In 1993, however, the interest waned. Crystal Pepsi didn’t taste any different than regular dark Pepsi, which confused people because clear colas usually have a citrus taste. Sales dropped off and Pepsi pulled it off shelves. It was quickly reformulated into Crystal by Pepsi which was still colorless, but had a citrus taste like everyone expected. By then, though, the damage was done and Pepsi canceled the soda in America in late 1993 – 1994. 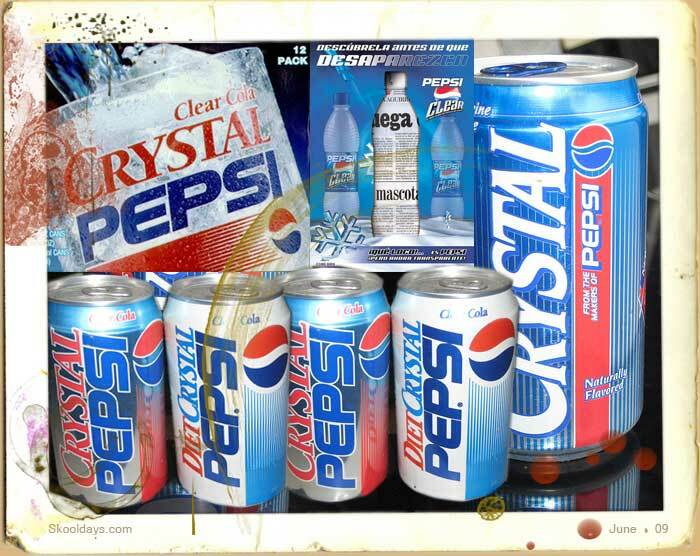 Crystal Pepsi continued to sell well in Europe for another year or so but was eventually canceled there also. As a promotion Pepsi released PepsiClear in Mexico in 2005. Presumably, it used the same Crystal Pepsi formula.